NOTHING BETTER illustrates the deviousness of media than their stories of art allegedly looted by the ‘Nazis’. The camera doesn’t lie; to television viewers and the media’s trusting readership photographic evidence of German wickedness appears undeniable. A lie will travel the world while the truth is still pulling its boots on. Corrupted mainstream media were unprepared for the onset of the Internet’s power to expose victors’ propaganda. Recent research across international archives opens up a Pandora’s Box of real history. Systematic pillaging and looting by the Allies, particularly the Soviet Union, is still a cause of heated disputes between Germany, Russia, and the United States. Most of the stolen artworks have never been returned to Germany. Images of discovered German artworks shown in tabloids and on television are genuine. However, the captions and stories behind the photographs are since proven to be half-lies or simply untrue. 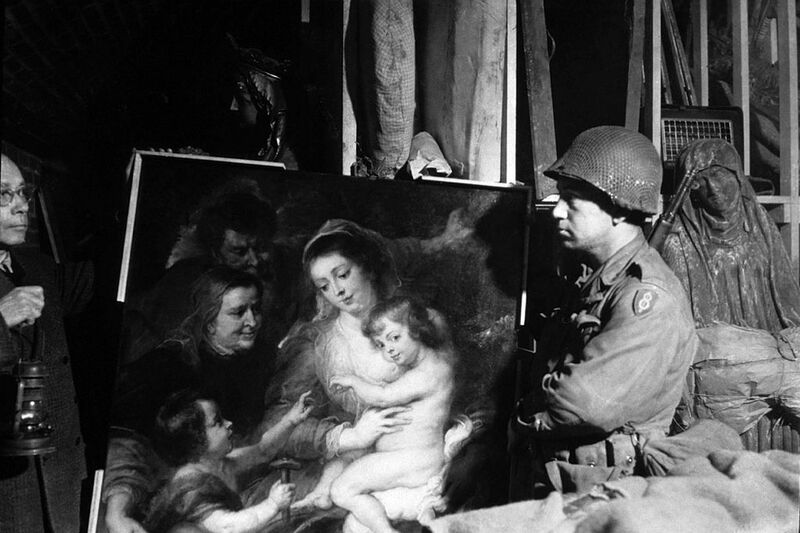 Pictures of US General Dwight D. Eisenhower and American troops ‘recovering looted Nazi art’ are nothing of the kind. These are pictures of the self-styled democracies’ art experts and allied troops not retrieving — but stealing — Germany’s legitimately acquired artworks. 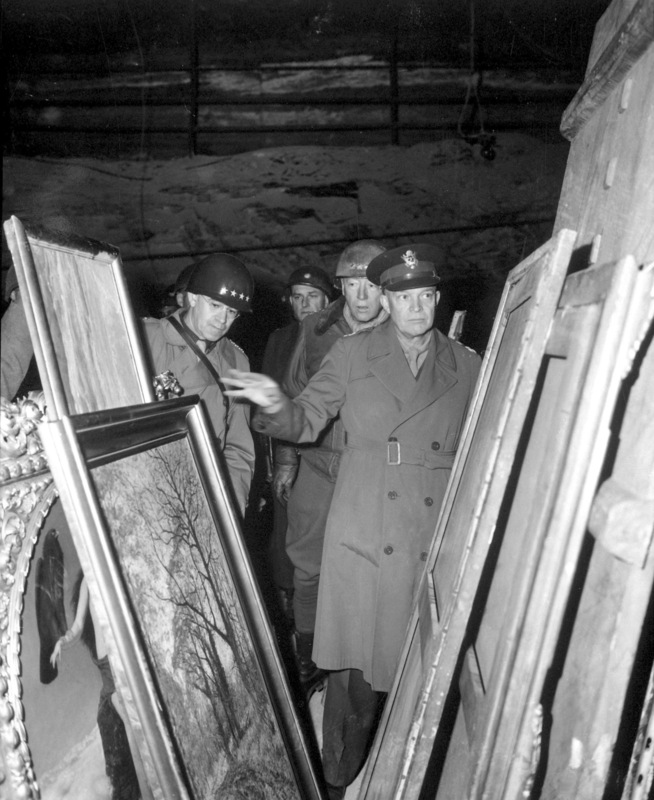 U.S General Dwight D. Eisenhower, Supreme Allied Commander, accompanied by General Omar N. Bradley and Lieutenant General George S. Patton, Jr., inspects art treasures secured from Allied air attacks by their being hidden in a salt mine in Germany. These artworks were looted and shipped to the United States where many are still illegally stored. 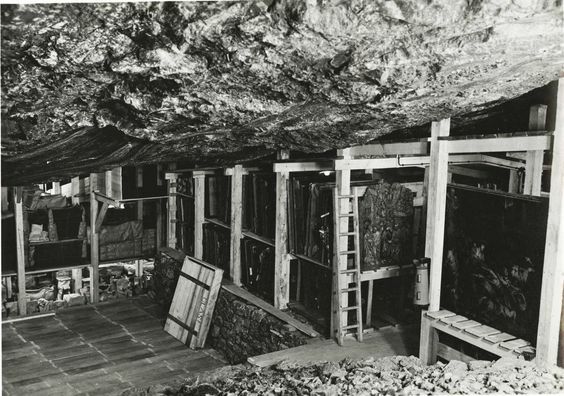 Thousands of pieces of artwork, artifacts, jewelry, and historical pieces were stored by the Germans in underground caverns. This was done primarily to save these treasures from the total destruction wreaked day and night by more than 1,000 Allied bombing raids. During the Allies’ war on the Reich the Berlin Bode Museum’s master artworks were evacuated to mines and into two bunkers to avoid their being damaged by the incessant bombings. Artworks that the media now claim to have been ‘stolen by the Nazis’ were legitimate German property. These were national treasures held by German museums and art galleries, and had been discovered or legally acquired by them. What readers and television viewers are in fact seeing is the wholesale looting, the plundering, of German artworks, treasures, artifacts and works of our European heritage. 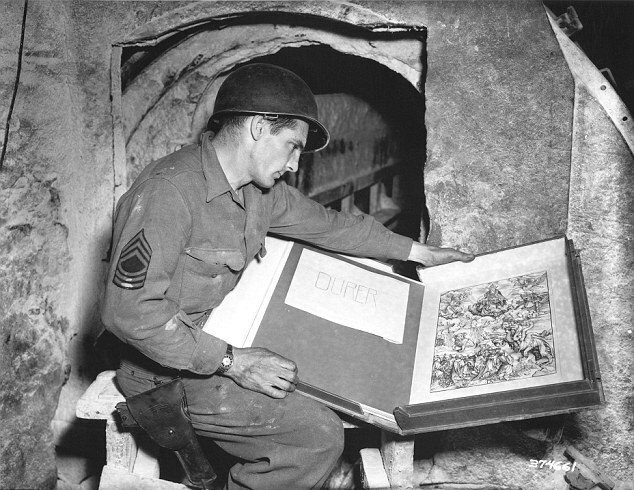 The German artworks and cultural treasures secured against Allied bombing and then looted after Germany’s defeat included 200,000 works of art that were buried along three kilometres of salt mines, also containing archival material and some three million books. The artworks were not hidden, as hiding such from the invaders was impossible. This engraving by the 15th century German artist Albrecht Dürer was among thousands of items stolen from the defeated Reich. Berlin’s State Museum alone lost around 400 artworks after World War 2. The German state of Saxony-Anhalt maintains a register entitled Beutekunst (looted art). This inventory catalogues more than 1,000 missing paintings and books believed confiscated by the US or the Soviet Union. 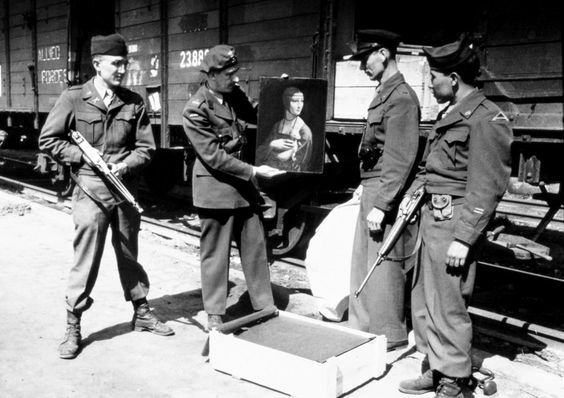 British troops and the Naval War Trophies Committee also looted German artworks. These included several pictures by German marine artist Claus Bergen, Wreath in the North Sea in Memory of the Battle of Jutland, The Commander U-boat, Admiral Hipper’s Battle Cruiser at Jutland and The German Pocket Battleship Admiral Von Scheer Bombarding the Spanish Coast. Carl Saltzmann’s German Fleet Manoeuvres on the High Seas and Ehrhard’s Before the Hurricane at Apia Samoa and During the Hurricane at Apia. These artworks were ransacked from the Naval Academy situated at Flensburg-Mürwik. The works of art are documented by a 1965-1966 Ministry of Defence file available in Britain’s national archives. These stolen trophies (“prizes of war”) were sent to various British museums. Five of the looted German works of art remain in the National Maritime Museum in London (NMM). The work Before the Hurricane at Apia was lent to the Royal Navy’s HMS Calliope in 1959. This painting was ‘lost’ and formally written off in 1979. The National Maritime Museum admitted in January 2007 that “the documentation at the NMM and the National Archives is not complete”. According to spoliation guidelines, the pictures should be regarded as having been “wrongly taken”. 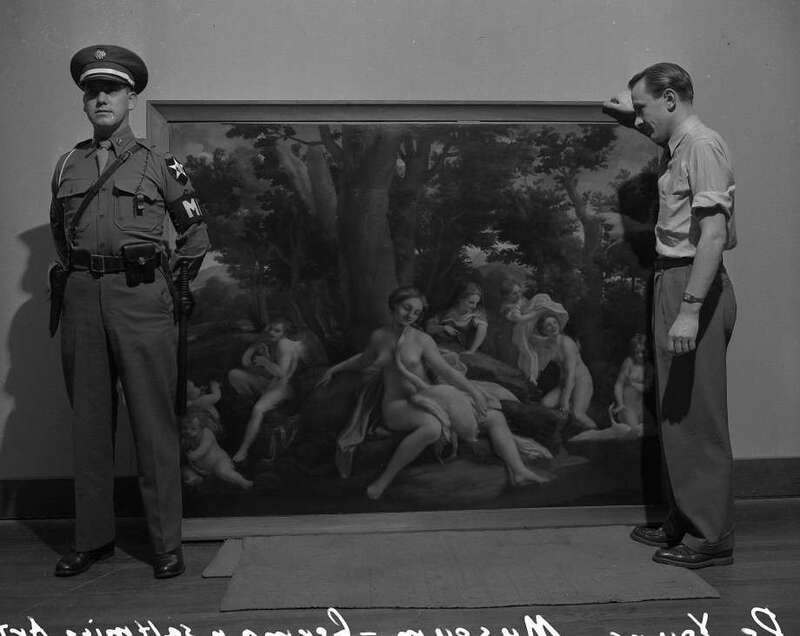 A collection of paintings in the San Francisco de Young Art Museum was part of the loot plundered following the discovery of Germany’s secured art treasures. 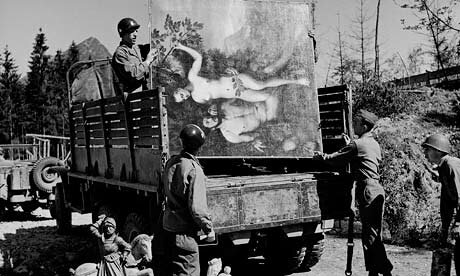 The de Young museum contains 95 paintings of the 202 looted artworks that are documented as having been shipped to the United States after the war’s end. A December 1948 show at San Francisco’s De Young Museum of some of the art plundered from the ransacked salt mines discovered in Bavaria by the occupying United States Army in 1945. Almost all these paintings had come from the Kaiser Friedrich Museum in Berlin that in 1956 was renamed the Bode Museum. Rembrandt, Hals, Botticelli and Vermeer were among the artists in this stolen collection. The 95 paintings were valued at $50,000,000 in 1948. 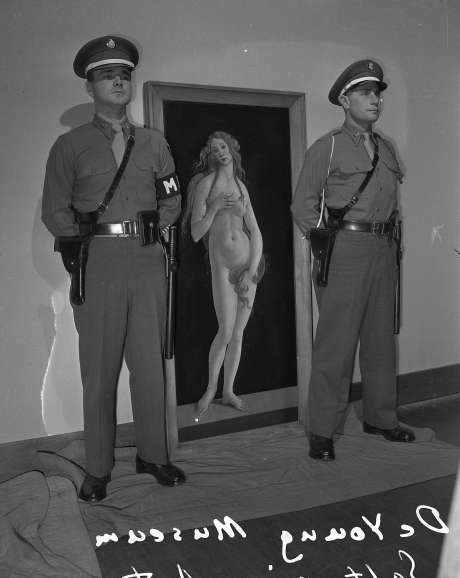 This looted Botticelli painting requires two armed guards at this San Francisco’s De Young Museum 1948 exhibition. 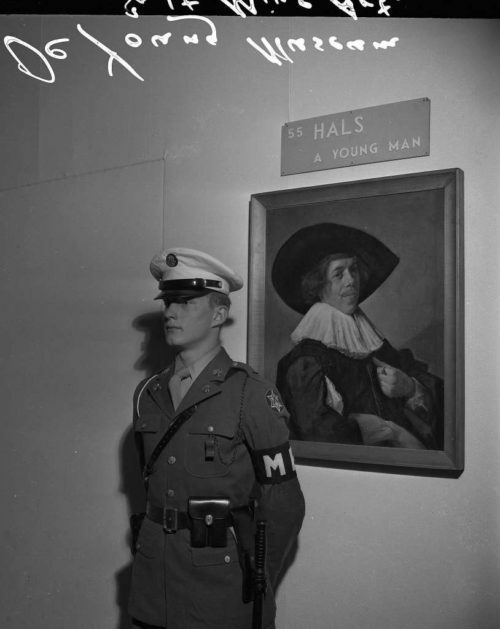 A U.S Military Policeman makes certain that this American looted painting by German artist Franz Hals was not going to be stolen. 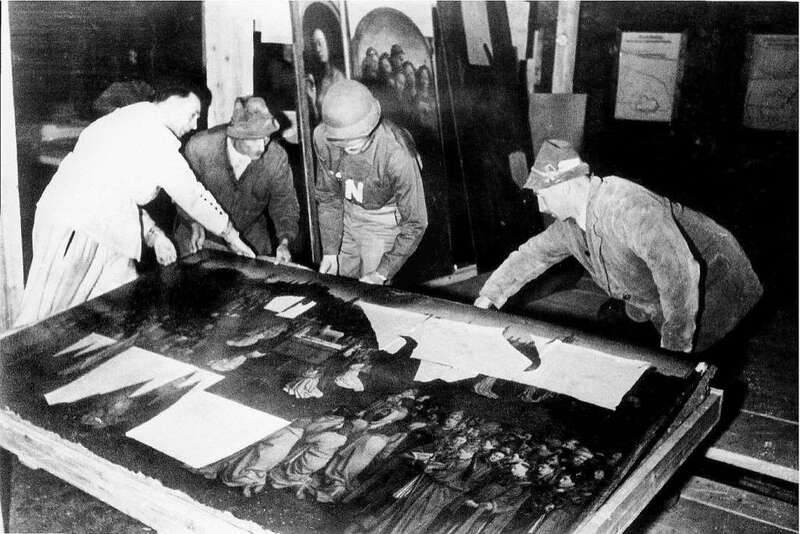 This photo provided by the Monuments Men Foundation for the Preservation of Art of Dallas, shows Monuments Man George Stout, third from left with an N on his shirt, moving the central panel of the plundered Ghent Altarpiece discovered in Altaussee, Austria in July of 1945. Liberated from the clutches of the high interest Western banking elites, Hitler’s Third Reich soon became more prosperous than the United States of America. When discovered by the invaders, the Reich’s gold and silver reserves were shipped to American banks. 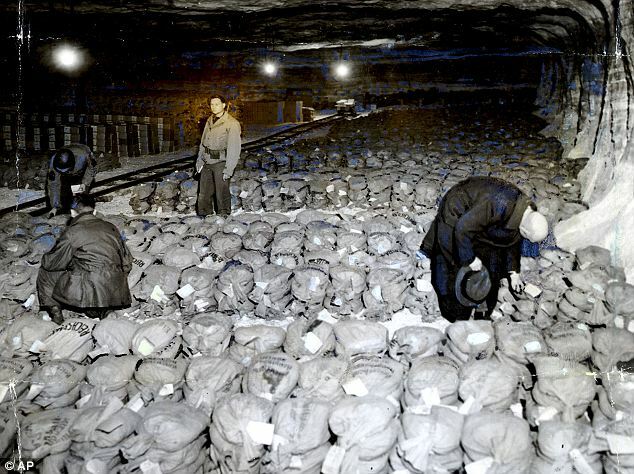 Here we see troops from General Patton’s Third Army standing among gold reserves hidden in a salt mine. This is new… but not surprising. I did not know about the Allied theft of German art work and treasures after the war. I WAS aware of the theft of whole factories that were boxed up and shipped off to Russia, the theft of large German territories and the forced expulsion of the German populations from their ancestral lands, an ethnic cleansing that was fatal for many thousands of German civilians. I was aware of the betrayal of Germany by the Allies who forced millions of German prisoners of war into the slave and death camps of Stalin’s Judeo-Communist Soviet Union. I was aware of the Demonic intentions of the Jews to exterminate the entire German race, intentions that were eventually partially implemented by the Morgenthau Plan. Theodore Kaufman (0101-01-01T00:00:00+00:00). Germany Must Perish (Kindle Locations 9-11). Kindle Edition. And I was aware that Eisenhower DELIBERATELY murdered over a million German prisoners of war after 1945. Every time I see Eisenhower’s face I can now only think of the cover of the book “Other Losses” that describes Eisenhower’s death camps at Remagen. OTHER LOSSES caused an international scandal when first published in 1989 by revealing that Allied Supreme Commander Dwight Eisenhower’s policies caused the death of some 1,000,000 German captives in American and French internment camps through disease, starvation and exposure from 1944 to 1949, as a direct result of the policies of the western Allies, who, with the Soviets, ruled as the Military Occupation Government over partitioned Germany from May 1945 until 1949. Now I see that Eisenhower was responsible for the theft of works of German culture, a culture that in some ways represented the pinnacle of Western Civilization, a culture that he could never dream of creating for himself, but like the rest of his fellow tribesmen, a culture that he could only dream of destroying. One small satisfaction is to know that both Marx and Eisenhower are frying in Hell. But the destruction of Germany and all of White Western Civilization is an ongoing atrocity. Still, it’s an atrocity that will eventually be stopped, and then reversed, and then, if there is any justice in the world, those responsible for the attempted genocide of the white race will be made to stand before God, and be condemned to their eternal damnation. An excellent letter, part of which I will keep and use. For instance, the new to me Marx comment. I should have been more precise about the origin of the “Marx” quotation. The title of the poem from which the “Marx” quotation was taken was hard to find. I got the verse I quoted from the book “Marx and Satan” by Richard Wurmbrand. The title of the poem I gave you was probably wrong, but the author of “Marx and Satan” didn’t say what the title of the poem was..
Richard Wurmbrand. Marx And Satan – 1 (Kindle Locations 11-13). Good luck trying to find the actual poem from which the quote was taken. I’ve given up trying to find it, for now. but the archive is massive, so gave up trying to find it there too. Read “Marx and Satan” to understand how sick the creator of Communism really was. Lots of good stuff at Mikes blog..
HA ! Correction. Found it !… sort of…”Human Pride” by Karl Marx. The “Greatest Generation” at work! Ha! with the knowledge of what they fought for.